It never ceases to amaze me the reach of our printing. This week we were printing some conference flyers that are being shipped out from Belfast to San Francisco this very morning. Almost an A6 Trifold, these flyers were printed on 300gsm bond card and concertina folded to not only make an itinerary, but also a map of events, and a list of workshops over the 2 day event. The design was carried out by the React teams in-house designers and sent to us ready to print. We litho printed the leaflets to ensure the highest quality finish and with this being on a bond uncoated paper it really gives a luxurious yet cost effective finish. The real issue was getting this flyer printing turned around in record time to ensure it could be shipped with the courier in time for the eventâ€¦.and we delivered. We also printed a number of PVC Banners and Roller Banners to be used as internal branding around the conference venue and on the stage podium. All being shipped out to the United States of America today. About React React is a 2-day, single track conference with follow on workshops about building reactive systems. Suitable for those who build or are building large scale applications and systems, it is organised, curated and delivered by developers at the heart of the reactive community, React is your opportunity to share in their experiences and lessons learned in building some of the most complex and demanding software systems. The conference takes place in the wonderful Cobbs Comedy Club (915 Columbus Ave, San Francisco, CA 94133). Just over 5000 miles from our Belfast office. 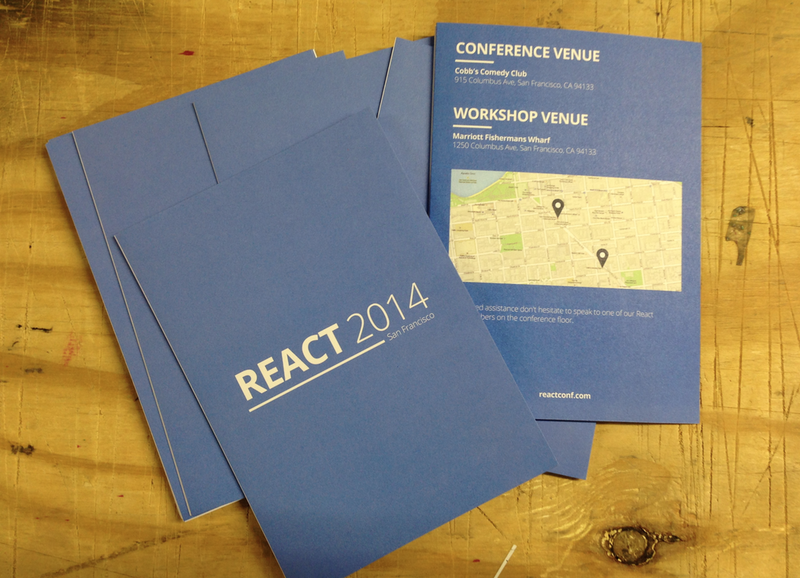 You can follow the React Conference and engage with them on twitter @reactconf.